Eagle is proud to introduce QuadAdjust™ Shelving that allows for even more flexibility, functionality and value for the foodservice industry. Eagle is proud to introduce a new shelving product that allows for even more flexibility, functionality and value for the foodservice industry. The company's latest introduction, QuadAdjust™ Shelving features a special design that makes it easier than ever to change shelf configurations to meet individual needs. Eagle's familiar, numerically calibrated, grooved posts and tapered split-sleeves combine with an ingenious patent-pending "collar" design to make shelf reconfiguration easier than ever - without the need for tools and without disassembling the entire unit. The inventive "collar" also makes adjusting a shelf's height or completely removing a shelf just as easy. The new QuadAdjust™ Shelving incorporates Eagle's patented, super-strong QuadTruss™ design, making it one of the strongest and most durable in the industry. Four horizontal truss wires provide maximum load-bearing weight per shelf. Unique pincer-type design, with reinforcing mat wire between the two top truss wires, distributes shelf load weight evenly, thereby reducing stress and strain on the welds. Deflection tests conducted under laboratory conditions show that the shelving is up to 25% stronger than competing wire shelving products. Eagle's new QuadAdjust™ Shelving is offered in most popular sizes and finishes. According to Larry McAllister, Eagle's president, the addition of QuadAdjust™ shelving to Eagle's product lineup rounds out an already comprehensive line of shelving, storage and transport products. "More flexibility and more functionality are what today's foodservice professionals are looking for," McAllister said. "Our design gives them the ability to obtain a highly efficient, labor-saving shelving solution that combines strength, adjustability and quality at a very competitive price." The introduction of QuadAdjust™ Shelving is yet another example of Eagle's continuing commitment to manufacture a broad line of U.S.-made products for the foodservice industry. 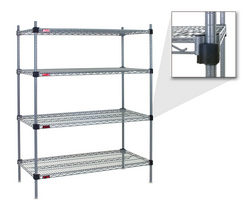 For more details on the new QuadAdjust™ Shelving, contact Lynda Donavan (ext. 3027) with sales inquiries, or Eagle's Marketing Department (ext. 3129) with inquiries pertaining to marketing support. Tel. (800) 441-8440 or (302) 653-3000. Web: http://www.eaglegrp.com/.